Welcome to Coding Club! Thursdays from 5-6 pm for ages 6+. Hour of Code (your choice): Complete 2– Click on the link and earn a completion certificate. Watch all videos and Look at the code you write after each puzzle. Learn How To Make a Project in Scratch – http://www.scratch.mit.eduJoin Scratch. 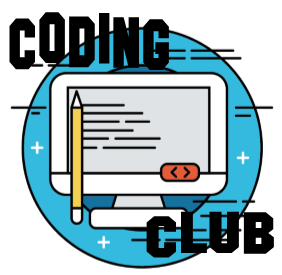 Record username on your Code Club Membership Form. Work with getting the cat to dance. When a “scratcher” makes a copy of someone else’s project and midifies it to add their own ideas, the resulting project is called a “remix.” Even a minor change is a valid remix (like changing scripts or costumes) as long as the credit is given to the original project creator and others who made significant contributions to the remix. Complete 5 Challenges – Remember to “See Inside” for each challenge. a. http://scratch.mit.edu/studios/456154/ – “The Little Book of Programming Challenges”. b. http://scratch.mit.edu/studios/520375/– “10 Blocks Challenge”. Scroll down to the bottom of the page and click on HTML & CSS under Learn to Code. Click on +Create – New Program. Create a game to share with your friends. 1. Complete 10 Challenges – Remember to “See Inside” for each challenge. Scroll down to the bottom of the page and click on jQueryunder Learn To Code.